Product information "One-Step Luciferase Assay System"
The One-Step Luciferase Assay System is designed to be used for high-throughput, sensitive quantitation of firefly luciferase activity in mammalian cell culture. 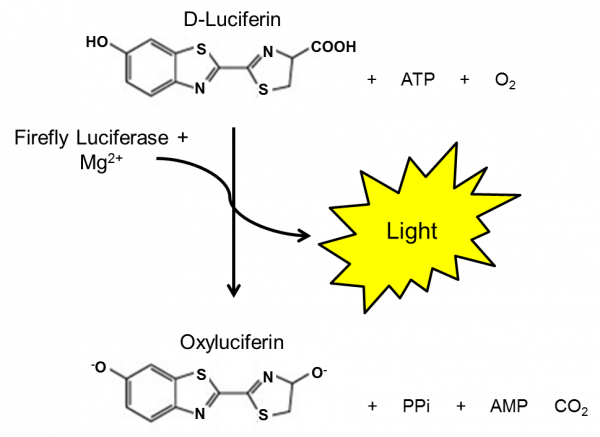 The reagent consists of two components, a Luciferase Reagent Buffer (Component A) and Luciferase Reagent Substrate (Component B). Component A and Component B are combined to form a working solution that contains all the necessary components for cell lysis and luciferase quantitation. This assay system has several features:  Sensitive - highly sensitive detection of firefly luciferase activity.  Stable - the signal output is stable for more than two hours, providing flexibility with regard to incubation time  Convenient - simple one-step, homogenous protocol.  High-throughput - one-step homogenous protocol minimizes handling steps to support high-throughput screening applications  Compatibility - works well with a variety of common media containing 0-10% serum and phenol red.  Instrumentation - does not require a luminometer with injectors. Customer review for "One-Step Luciferase Assay System"